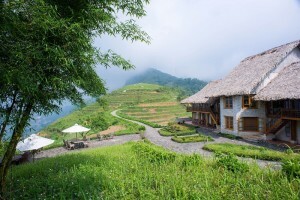 Topas Ecolodge is located 18 km from Sapa, deep in the Hoang Lien Mountains. 25 bungalows overlook the entire valley with the ethnic minority villages of Ban Ho and Thanh Phu, 400 altitude meters below. With 2 nights at Topas Bungalows, Sapa trekking tour & Topas Ecolodge 3 days is your chance to swallow the panorama view of the rice fields in mountainous area. From your bungalow, you will catch a glimpse of hamlets of thousands ethnic minority people. Your journey from Hanoi to Sapa and back are by Eco Sapa Limousine Bus – an 8 seat luxurious limousine with modern interior design, spacious and soft chairs. It offers you a comfortable 5 hour journey. With this bus, it will drop you at Sapa, then we arrange private car to transfer you to Topas. And day back, we arrange private car from Topas to Sapa, then Eco Sapa Limousine Bus pick you back Hanoi. From 7:00 – 7:30 AM, Eco Sapa Limousine Bus will pick you up at your Hanoi hotel before departing Sapa for a 5 hours transfer to Sapa Town. Most of the drive is on the highway. The bus will drop you at Sapa Town, then we arrange a private car to transfer you to Topas Ecolodge. On the way, you will have the opportunity to enjoy beautiful areas, home to many minority villages. Well arrived, the rest of the day is at your leisure. You can book a special traditional Red Dao herbal bath or massage at the lodge’s newly opened spa or go for an excursion to the surrounding villages. We will start the day enjoy your breakfast. At 9:30 you will start your half day hike to visit the Lech village of Red Dao minority. We will follow the road for a while before descending towards a river. Going through rice paddy terraces gives you many opportunities to enjoy the magnificent valley view. We cross the river by a bridge made of stone and then follow a trail going up to the village. You will be able to spend some time at the village to experience daily life. And learn how to the women in their doorways doing their embroidery. From the village, you head back to the lodge for lunch. The morning is at your leisure at Topas Ecolodge. You can either relax or borrow free of charge high quality mountain bikes from the lodge for an exploration to surrounding areas. You can also take a scheduled shuttle bus to Sapa to visit the town or book a half day tour to explore the highest peak of Indochina, Mt. Fansipan (3.143m) by the newly launched cable car. We arrange private car from Topas to Sapa at 14:20′ p.m, then Eco Sapa Limousine Bus pick you back Hanoi. The bus will returns you at your hotel in Hanoi Old Quarter. The trip will end at your hotel ! Note : Other meals at Topas Ecolodge are recommended to be booked in advance.